Für die Deutsche Version hier klicken! We’ve talked to Peter Kossits. He is the App-Designer of “Baseball Highlights 2045” and “Hostage Negotiator”. Peter tells us, what he is planning for the future, why he is making Apps and how he chooses games, which are worth to be an app. When did you decide to make Boardgame Apps? What were the intentions? The company that I was working for for almost 20 years got purchased by a huge US company and we all thought that was very good news and things would get better. But 2 years later, they decided they didn’t want us any more and they announced that the office was going to be closed in 2 months. All my friends were running around trying to find new jobs and doing interviews, but I was just spending all day reading about developing apps and thinking if it would be worth trying to start my own little business, and then I started thinking about what type of apps I could try to write. It was during a visit to Boardgame Geek that I noticed that boardgame apps have a great advantage – you don’t start from 0 customers like most apps. You start with the number of people who like the boardgame a lot. So when the job finally ended, I started learning Unity and C# at home. C# was a new language for me, but I have been a programmer for a long time and learn new languages very fast. I did exercises for a month and then started working on Baseball Highlights to see if I could do it and that eventually became the official app. Why did you decide to make Boardgames for PCs, Smartphones and Tablets? Isn’t there much more money in so called “pay to win” Games? I wrote my first game for PC, Faceoff Hockey, in 1995 after finishing school. It was such a fun project and so much more interesting than the programming I would be asked to do at my real job. So that’s the main reason – working on games is usually a lot of fun and is a very challenging and interesting type of programming. Regarding “pay to win: games” – you don’t see too many games like that being written by solo programmers. That’s the type of things that companies will do. There is a lot of code and a lot of thinking that has to go into deciding how to handle all of the micro-transactions in games like that, and it’s not usually the type of code that programmers would call very interesting. If a programmer is worried about just making money, he won’t work on games at all. He will work for a bank. Are your Apps orders by the game publishing company or did you ask them? I usually spend 6 months writing a rough version of the game and then I will show it to the boardgame company and they will say “yes” or “no”. It was like that for Baseball Highlights 2045 and Hostage Negotiator. For my next game, I probably won’t have to do that since I have a history and people can see my work easily. How do you decide, if a Boardgame will be worth the designing for the digital sector? I like games that are fairly new and still have a little excitement surrounding them. I finished Baseball Highlights less than two years after the boardgame came out and Hostage Negotiator was just a little bit older. I like games that have a few expansions that don’t change the game too much in crazy ways. I check how many comments/ratings the game has on Boardgame Geek and how popular it is. I check how complicated the game is and try to estimate how difficult it will be to test. I look at whether it needs an artificial intelligence and how hard will it be to write a decent one. 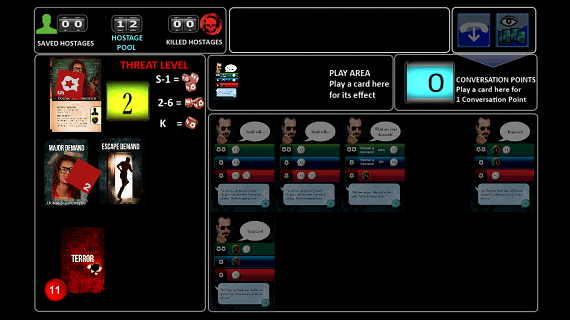 For Hostage Negotiator I was lucky and it did not need an AI. So, you’ve got a new game to work for. What are the first steps to do? I usually start by scanning the components of my copy of the boardgame and then try to build a very basic version of the game using those. I don’t worry about how things look at this point, but I am trying to figure out the easiest way for the user to interact with the game and the best way to organize the computer code that will keep track of the rules of the game. It usually takes me one month to have a very ugly and basic version of the game that is still almost fully playable. It is essential, that the digital game looks like the Boardgame itself. How does the graphics come into the game? Do the publishers forward you some material, or do you make them by yourself? Actually I have been criticized by some people that my apps look too much like the boardgame set-up on a table. A lot of people expect something a little different. I ask the boardgame designer to send me copies of the files used to produce the boardgame and I will work from those. For Baseball Highlights, 99% of the graphics came from boardgame graphics. 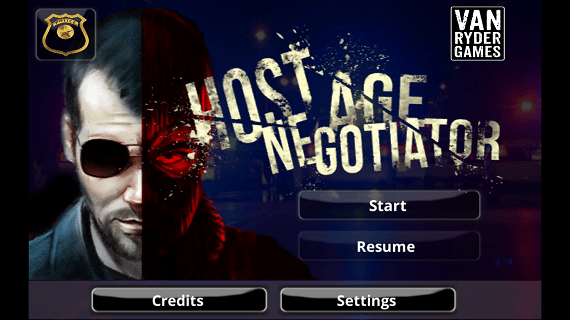 For Hostage Negotiator, I did a few little things myself, but again it is mostly the boardgame art. What is the most important part of your work with a new game? Lots and lots of testing. I am very happy that both of my apps have had very, very few bugs. It’s not something that most people notice, but it’s always the most important thing in software. Where are the most problems? What gives me the most trouble is working with very small phone screens. I have to be honest – I think that tablets are great for boardgames, but phones are just too small. I try to do the best I can, but it never seems to feel very good. I have the same complaint when I try to play boardgame apps created by other developers. How long does it take to make a Boardgame App? They usually start to feel finished after about a year, but then it takes another 6 months to finish the project for real. What was the funniest Bug, which have you had in any stadium of development? At my old company, we made software for big electric companies and one of our customers saw a message that said “Sorry, your operation did not work. You should call Bobby at <Bobby’s phone number>”. The customer had a sense of humor and called to talk to Bobby instead of complaining to our boss. Bobby thought that the situation would never, ever happen, so he put a little joke in the code. So, you made until now “Baseball Highlights 2045” and “Hostage Negotiator”. What kind of feedback you’ve got for the Apps? Hostage Negotiator is a little funny. The #1 comment for this game is that there is too much luck and no strategy. The game is actually full of strategy and if you practice and learn how to play well, you can win close to 100% of the time with the first 3 villains. I started seeing this while I was working on the app. I would just lose and lose and lose all the time at the beginning and then after I started thinking about it more, I learned how to win. It takes a little patience and effort though. For Baseball Highlights, the comments are usually very good. It’s such a well designed, well balanced boardgame and it’s always fun to play, even when you lose. The #1 bad comment is that it’s a little ugly and I agree with that and am trying to improve it now, 2 years later. I think a lot of people who leave bad or nasty comments don’t realize that I am one person working on it full-time for a year and a half. They almost always think it’s a company or a team making the app. If you look in the past with your knowledge of today. Is there anything you would do in an other way? I went though a difficult period at my job 10 years ago where I didn’t enjoy going to work for a few years. If I knew what I know now, I probably would have taken some time off to start my own little company and work on some personal projects for a little while. I was too scared to try it back then, when I was 40, because of losing a good salary. 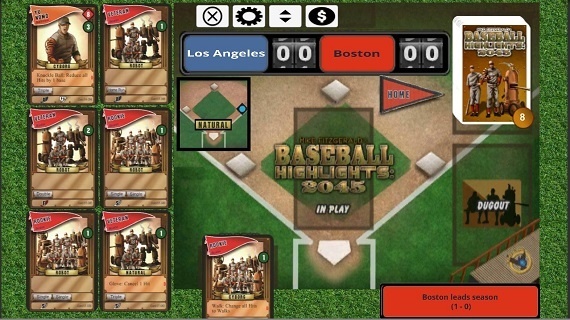 You’ve told me, that you are working for Updates for “Baseball Highlights 2045”. What are you planning for the new version? Mainly bringing graphics and new techniques over from Hostage Negotiator. Baseball Highlights was my first time coding in C# and Unity, but now I have close to 5 years experience in both of those, so I can do things easily now that I couldn’t do then. The scoreboards have already been changed. I will probably be changing the way the cards are displayed on phone screens. There are also a few expansions and new teams that I can add in. I want to add a Hard level to the AI. If there is time, I might experiment with multiplayer. We’ll see how much of that I can do. This is a little mini-project to keep me busy until work on the next game starts. Are there some new Apps you are working on? Not right now, but there might be a new one starting soon that will be similar to Baseball Highlights. But it’s about a different sport. Have you got a Boardgame you always dreamed on port it for the digital sector? There’s a solitaire wargame called Fields Of Fire that I think would work really well as an app. I would probably start working on that one if I wasn’t concerned at all about money. There’s another very, very old solitaire game called Ambush that would be a lot of fun as an app. Now I got some personal questions. Everyone has to answer them. What are you doing, if you are not working or playing games? Is there even time for another hobbies? I play guitar, flute and saxophone so music is my big hobby outside of games. One of the last books I read is Into Thin Air, about a big disaster on Mount Everest a little while ago. I have become interested in mountain climbing in the last few years and love watching videos about expeditions to Everest and K2. So you are faszinated about the K2? How about a boardgame app of the game K2 from rebel? That looks like it might be a very good candidate for an app. I will take a bit of a closer look at it. I haven’t actually played any boardgames about mountain climbing. The Great Escape. A game of cat and mouse in a prisoner of war camp in WW II. It’s so much fun! Well, at least until the end. This story should also be made into a boardgame. Chess and Advanced Squad Leader are the perfect games for this because they take so much time to learn how to play very well. And on my island we have lots of time. Time Of Soccer – There has to be some sort of serious sports league on the island! Time of Soccer is a pretty good choice for this. We will all play one week of the season every night after supper. Twilight Struggle – There are three reasons for this choice. #1 It’s always fun. It’s very similar to Risk, but very, very serious. #2. There is a way to play it solitaire which works very well. #3 It has a map of the world. If I need to escape from my island, the map may be useful. Mensch ärgere Dich nicht – For sentimental reasons. My family is from Austria and I played this a lot when I was young. Monopoly – This is the perfect game for hell. No one plays with the normal rules and the games just go on forever. Game apps are much, much too cheap!